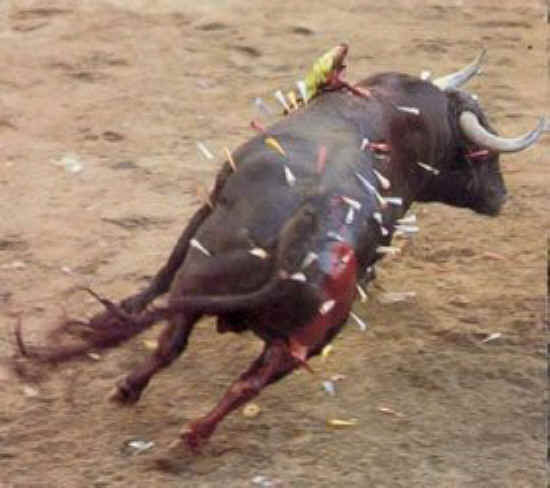 We have been sickened and horrified by the torturing of the bulls at Toros de Coria for Saint John. In our opinion this event is a blasphemous act against God and the Church, and a blight upon your country. Please use your good offices to help end this torture of animals. Following is an action alert about this event, and below the alert is our contact information. We are constantly hearing from people about how tortured their souls and spirits are, because of the Church's action, or lack of it, when it comes to animal issues, and many of these people have left their church because of it and turned against Christianity. 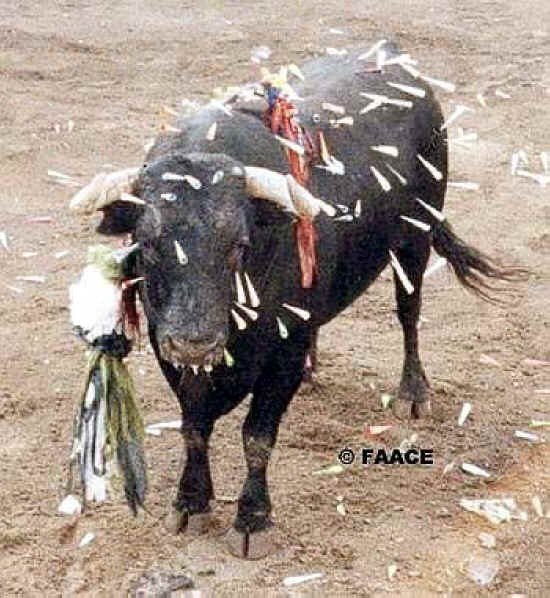 Toros de Coria is one of the most blasphemous and sadistic forms of "entertainment" that we have ever seen, and the Church's silence and acquiescence about this event is the primary reason it continues. 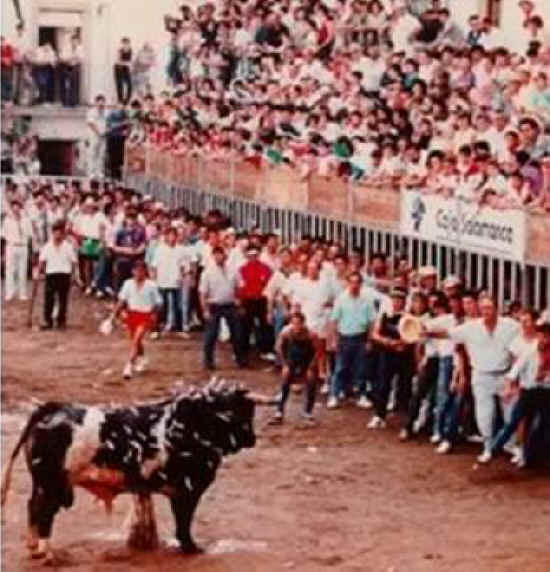 Rosa writes: Every year between the 26th and 29th of June in Coria, Extremadura, arguably the most backwards region of Spain when it comes to animal issues, a hapless bull is horribly tortured to death by the rabble. He is made to walk for hours while being tortured with darts, directed especially to his eyes and other delicate parts, until he gets so tired from the stress, the pain and the blood loss that he lays down to rest and that is when the barbarians fall on him and cut his testicles while he is still alive. Rosa continues: No-one that has a minimum of sensitivity or conscience can understand what moves humans to do things like this but they do, and it happens all over Spain and also in parts of Mexico, Brazil...while the authorities at best ignore it, at worst declare it of "cultural interest" and promote it! Most of these events are dedicated to saints from the Catholic church (Saint John for the Toros de Coria). 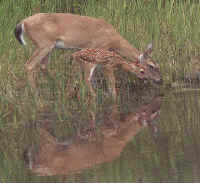 We can understand why these hard hearted government officials and politicians support such cruelty: they are trying to buy votes, just as our politicians do when they kill innocent animals in hope of buying the votes of the 4% of Americans who hunt. However, we can not understand how the church, particularly the Catholic Church, can sit "idoly" by and support such ungodly and satanic torture, whether through their silence or actual support. If you are sickened by this event as much as we are, then speak out and tell your pastor and church leaders; and help the church end its silence and take a stand against this event and all other forms of animal abuse and exploitation. Also write to the Spain's Ambassador to the United States, or to the Spain's Ambassador in your country, and ask him to use his good offices to end this blight upon his country.